The first part of this report, Studio Culture Critiqued, explores the current state of studio education, examines outside forces impacting architecture education, and calls for change in studio culture. Describing Studio Culture analyzes the historical roots of studio culture, states a series of myths prevalent within studio education, and discusses other elements that characterize this culture. In the section titled Current Aspects of Studio Culture, we provide a more in-depth commentary on twelve topics that we feel most be questioned in order to design a more successful studio culture. New Visions, Shared Values proposes five values, Optimism, Respect, Sharing, Engagement, and Innovation which we believe could serve as the foundation for necessary change. In the portion titled, A Call to Action, we have suggested roles that students, educators, administrators, and organizations can play in shaping a new future for architecture education. A New Program for the Design of Studio Culture lists a number of goals that can be embraced in creating change. 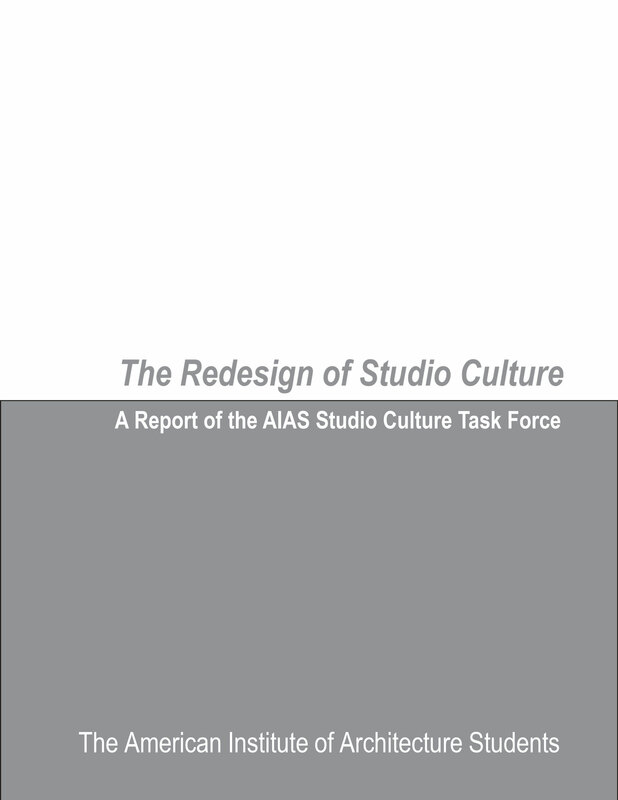 Finally, the Afterward section includes a description of the process of the Studio Culture Task Force’s efforts, acknowledgements to essential individuals, and a list of works cited.